to free up nutrients (more). Lunar soil - Scientists with the European Space Agency (ESA) has demonstrated that French marigolds (Tagetes patula L.) can grow in crushed rock (anorthosite) very much like that commonly found on the Lunar surface. No additional plant food (i.e., nutrients such as fertilizer) was added to the soil, but certain soil and symbiotic root bacteria were needed to free up essential minerals (such as potassium) in a form that the plants can use. 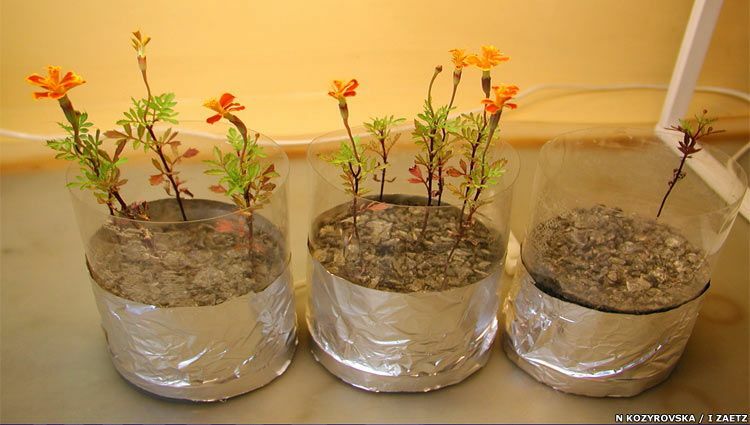 As bring soil and plant nutrients from Earth would be very expensive, this demonstration was a significant first step for developing recycling systems for future lunar settements (more from Richard Black, BBC News, April 17, 2008; and Lytvynenko et al, 2008). Crushed Anorthosite is good analog for the lighter areas of the Lunar surface visited by NASA's Apollo Missions. shadow, and the first to be deployed, lunar rover at the summit of Mount Hadley Delta (more). © 2008 Sol Company. All rights reserved. SolStation.com and ChView are trademarks of the Sol Company. Any other trademarks appearing on this website are the property of their respective owners. Unless explicitly stated, SolStation.com and the Sol Company do not imply any business relationship with Earth-based institutions.